Escape the downtown Rome crowds and head off the beaten track to discover one of the city’s most infamous districts. 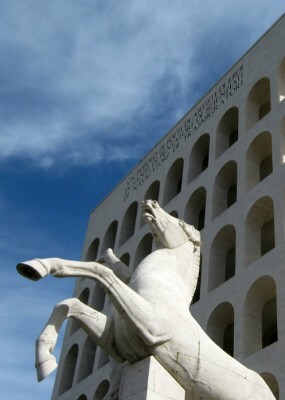 The Esposizione Universale di Roma (better known by its acronym, EUR) was commissioned by Italian dictator Benedito Mussolini in the 1930s to showcase architecture that portrayed his fascist ideologies. Today, it is a thriving commercial suburb. The creation of the EUR was a huge, 1930s urban regeneration project, spearheaded by Mussolini, Italy’s controversial prime minister and self-titled Il Duce (meaning “the Leader”), who intended to showcase the area at the 1942 World’s Fair to celebrate 20 years of fascist Italy. However, the World’s Fair was abandoned at the onset of World War II, and, subsequently, Mussolini’s ambitious EUR project was left incomplete. Although work continued after the war ended, the newer buildings lacked the influence of political agenda and failed to match the grandeur of the regime’s earlier architecture. The area as it stands today retains the tantalizing air of an unfinished project. After the war, the uncompleted EUR development was severely damaged. However, the Roman authorities found that EUR could be the onset of an out-of-town business district, which other capitals did not begin planning until decades later (London Docklands and La Défense in Paris). 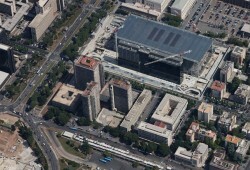 EUR was almost fully completed for the 1960 Olympics, held in Rome. management and organization of the area. the “reactionaries” and Giuseppe Pagano for the “progressives”. 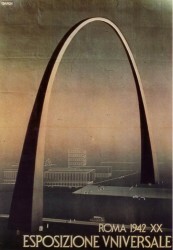 Each of them brought in their own preferred architects to design individual buildings within the district. EUR offers a large-scale image of how urban Italy might have looked, if the Fascist regime had not fallen; wide axially planned streets and austere buildings of either stile Littorio, inspired by ancient Roman architecture, or Rationalism, modern architecture but built using traditionallimestone, tuff and marble. EUR is the place of many companies and public bodies, such as Confindustria, the Ministry of Health, the Ministry of communications, the Archivio Centrale dello Stato, the Ministry of the Environment, the SIAE, the ICE institute, Eni company, Unicredit, Poste Italiane, INAIL, INPS, and many other multinational companies. It also hosted the Nato Defence College from 1966 until 1999. The project area is occupied by the ex Ministry of Finance Towers. At present, the towers were partially demolished and was left only the main structure. Each tower is composed by 18 levels and has a height of around 60 meters. The two lower buildings are composed by 4 levels and have a height of around 15 meters. “A building designed by Italian architect Renzo Piano has been given the go-ahead and will be constructed on the current site of the towers that once housed the ministry of finance in EUR. The plan for the building has been approved by commissioner Morcone who acts on behalf of the special commission governing Rome until a new mayor and city government is elected. The construction, including demolishing the towers, will be financed by a group of companies led by Alfiere, Fintecna, and Toti. Piano has designed his “glass house” (“casa di vetro”) along ecological and social principles that should save energy as well as providing a sense of well-being for people who use the space. It will be the second building by a famous architect being constructed in EUR; indeed, work on Massimiliano Fuksas’ glass building dubbed “the cloud” has already begun. The multifunction building designed by Piano will house shops, offices as well as apartments and will have an internal garden the size of a football field. The roof will have solar panels, a mirror that will reflect sun into the centre of the building and a greenhouse. The building will be C-shaped with the open side facing the lake and will use all the latest eco-sustainable and eco-compatible technology. 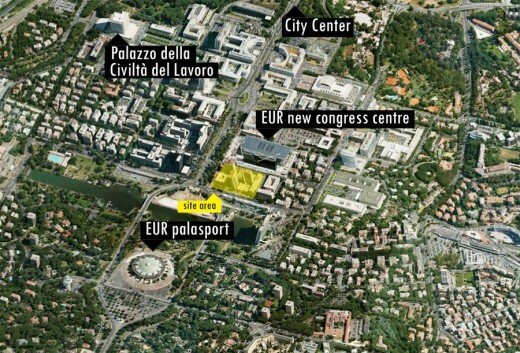 Piano’s glass house will be between the lake in EUR and right in front of Fuksas’ Cloud congress centre on Viale Europa. Piano has said that his building will be “like a magic box that will speak to the other glass building, that of Fuksas”. Fuksas’ building will be a comprehensive congress centre made of glass with a cloud-shaped structure suspended in its middle. These two innovative buildings will bring EUR into the 21st century and will transform the area by bringing more people and activity to this part of Viale America, which until now has been the dead part of the street between two successful business areas with offices, shops and cafés. The competition proposes the design of a multifunctional complex for different types of use: hotel, shopping areas, offices and public areas. Tower and buildings must mantain their existing features. Height, number of floors and number of buildings can not be changed. The structure of the building must not be changed. Designers can provide overhangs, roof garden, connections between the buildings, to use any material (according to the principles of sustainable architecture). It is possible, but not required, to change the position of the external staircases. One of the most important aspect is the solution of the facades of the buildings that will engage and interact with the nearby Convention Center designed by Massimiliano Fuksas. The project area is surrounded by elements of very high architectural and environmental value that will interact with the new buildings. The project must provide a unified image that must be recognizable and representative of the dominant characters chosen for the definition of the complex. 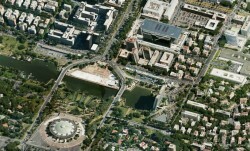 Another key element is the design of public and green areas. 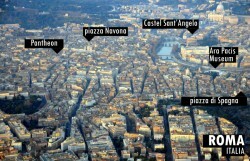 EUR is one of the most natural and green district in Rome and this feature should be emphasized in the new project. The project area must be provided with facilities and functions which will highlight the sustainable nature of the project (car sharing, bike rental, pedestrian paths, public green areas, electric cars etc.). • reduction of the water consumption. • social benefits such as creating new job opportunities and education for the community. • identify resistant, light, transparent and long-term materials. • experience the most innovative materials. • Participants can supplement functional program if they think it is necessary. Functions and dimentions are approximate. 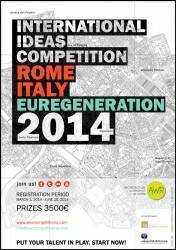 Students, architects, engineers, and designers are invited to participate to this competition. Admissions will be accepted for individuals as well as teams. Teams should be made up of no more than five members and can be multidisciplinary. TEAMS CAN HAVE MEMBERS OF DIFFERENT NATIONALITIES AND, IF STUDENTS, THEY DON’T NECESSARILY HAVE TO STUDY IN THE SAME CENTER. The registration fee are for teams and not for each participant or member of the team. Each team may submit only one project proposal that corresponds to the amount paid. The submission of more than one project proposal may be made only after the payment of an additional fees. The projects submitted are considered by the author that logs in to the Site and enter this competition. Every copyright infringement will be punished with immediate disqualification, excluding any compensation for the registration fee. The works reached out of time will be excluted. IT IS ABSOLUTELY PROHIBITED THE PARTICIPATION TO THE COMPETITION OF A JURY MEMBER, A RELATIVE OR A PERSON OR BODY CONNECTED PROFESSIONALLY TO THE JURY. Each winning project will be published (when it will be possible) on different scientific magazines and on several architecture blogs and websites, national and international. 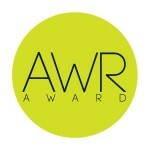 Winners and Honorable mentions will be published on the Website awrcompetitions.com. Awards are intended for teams, regardless if the participation is by individuals or groups. The prize includes bank or paypal commissions. All projects, without any exception, will be delivered no later than June 25, 2014.